Istanbul Atatürk Airport is the main international airport serving Istanbul, and the biggest airport in Turkey by total number of passengers, destinations served and aircraft movements. First opened in 1912 in Yeşilköy as a military airfield, on the European side of the city, it serves as the main hub for Turkish Airlines. As of February 2017, 273 non-stop destinations are served from Istanbul-Atatürk. The airport was originally named Yeşilköy Airport. 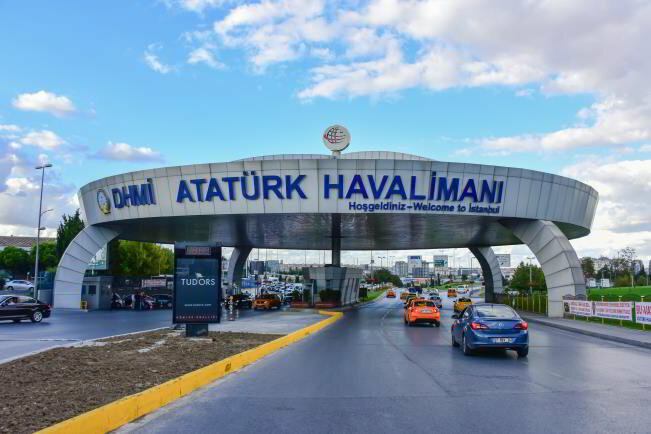 In the 1980s, it was renamed Istanbul Atatürk International Airport in honour of Mustafa Kemal Atatürk, the founder and first president of the Republic of Turkey. It served more than 60 million passengers in 2015, making it the 11th-busiest airport in the world in terms of total passenger traffic and the 10th-busiest in the world in terms of international passenger traffic. As of 2017, it is Europe's 5th-busiest airport after London Heathrow, Paris Charles de Gaulle, Frankfurt Airport and Amsterdam Schiphol Airport, having fallen from third place after a decline in passengers due to security fears. 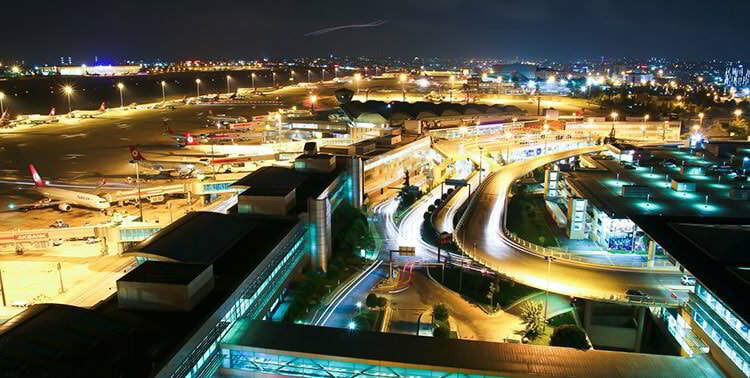 Istanbul Atatürk Airport features two main passenger terminals which are linked to each other. 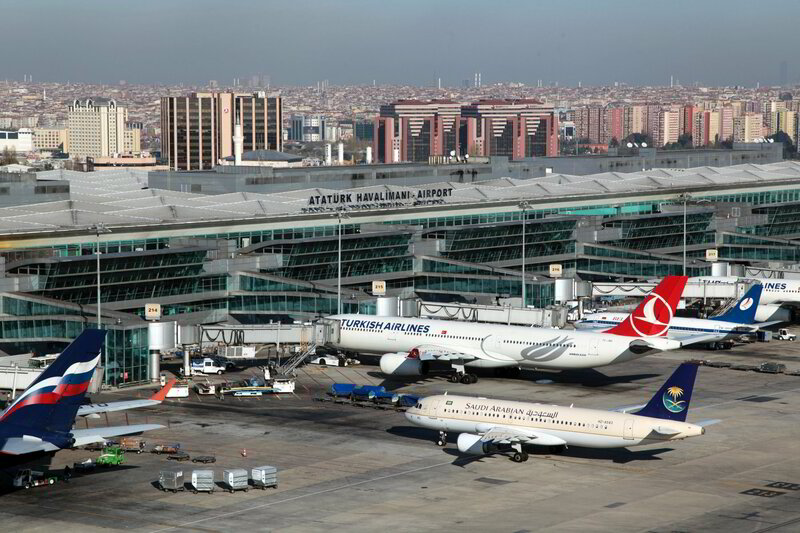 Domestic Terminal is the older and smaller of the two terminals and exclusively handles domestic flights within Turkey. Until the opening of the International Terminal, it was the airport's international terminal. Domestic Terminal features its own check-in and airside facilities on the upper floor that lead to twelve departure gates (101-112) which are equipped with jet bridges. On the ground level there are five baggage reclaim belts as well as a curbside independent from the International Terminal. The International Terminal was inaugurated in 2000 and is used for all international flights. It features a large main hall containing eight check-in isles and a wide range of airside facilities such as shops and restaurants. 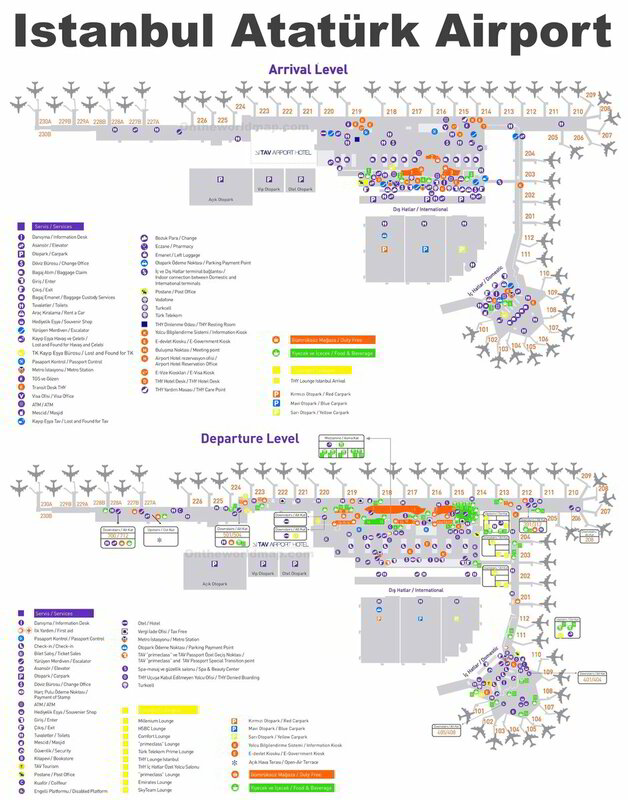 The departures area consists of 27 gates (201-226) which are all equipped with jet bridges as well as several bus-boarding stands. The arrivals floor below is equipped with 11 baggage reclaim belts. The International Terminal is able to handle widebody aircraft such as Turkish Airlines' Boeing 777-300ERs. There is also an additional terminal for general aviation to the northwest of the main areas as well as a dedicated cargo terminal including sections for radioactive and refrigerated freight. SimplyBusinessClass.com can save you up to 50% off your business class flights out of Istanbul Ataturk Airport. Call now or submit our flight request form to receive a free quote.